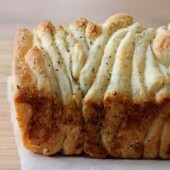 An easy recipe for homemade soft and airy garlic pull apart bread with Parmesan and herbs. I have this little issue. Maybe it’s more of a big issue. Put soft bread, especially warm nearly straight out of the oven soft bread, in front of me and I can’t help myself. It’s hard to stop, and even more so when it’s loaded with garlic and lots of other goodies. This might make you question why I’d even make bread if I know I’m just going to be tempted non-stop until it’s gone, right? Because it’s delicious! Who cares about self control when something is that tasty. I’ll have my regret when it’s all gone. Which at this point it is so very long gone. Honestly, this bread didn’t stand a chance at even making it through the night. I’ve been dying to make a savory pull apart bread since making a sweet apple cinnamon pull apart bread in September. And just like this one, that loaf disappeared too. Both so amazingly good. 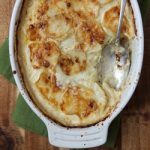 Carbs, garlic, apples, cheese… yum! Just not together ;) That might be a little too much for me. Don’t be scared by the amount of garlic. It might sound like a lot… 8 cloves for one loaf of bread?! It’s totally worth it and not at all overwhelming. I kind of wanted to add more, but this was perfect in the end. The only thing that might have made this bread even better would have been a slathering of butter or some dipping oil. Even without, it’s beyond tasty. 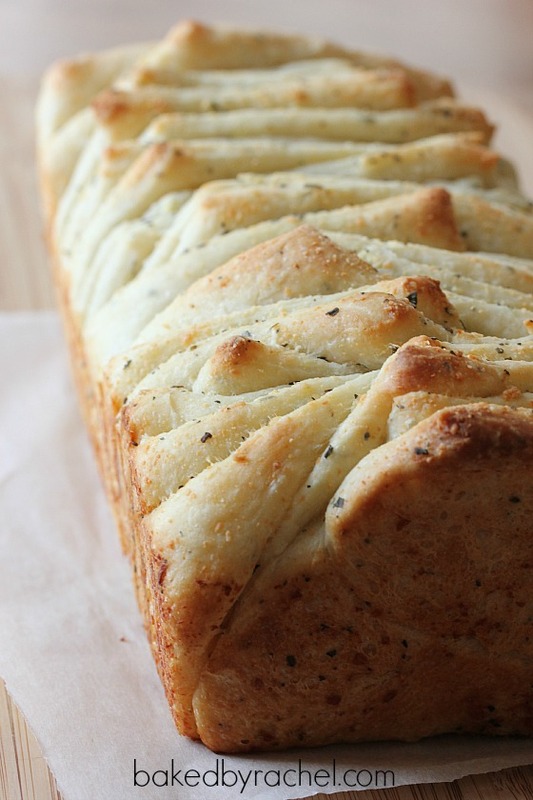 Soft and airy homemade garlic pull apart bread with Parmesan and herbs. Add first 5 dry ingredients to the bowl of a stand mixer, plus 2 cloves of garlic, minced and 1/2 tsp basil. With mixer on low, add olive oil, milk and warm water. Increase speed as needed, mixing until dough pulls away from the bowl, shape into a smooth ball. Transfer dough to a large greased bowl. Cover and place in a warm location until double in size. Roll out dough to a 12x20-inch rectangle. Generously brush with 3 Tbsp melted butter. 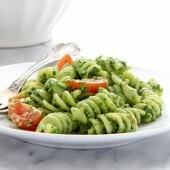 Sprinkle with remaining 1 tsp basil, Parmesan cheese and remaining 6 cloves of garlic, minced. Carefully cut into 6 equal strips, layering on top of each other. Cut into 6 equal stacks. Transfer dough squares to a lightly greased 10-inch loaf pan. Cover loosely and allow to rise for 30-60 minutes. Preheat oven to 350 degrees. Prior to baking, drizzle with remaining 1 Tbsp melted butter. Bake for 35 minutes, covering with foil if necessary to prevent over browning. I made this last night. It was absolutely amazing, and paired great with my pasta. My guests loved it!! 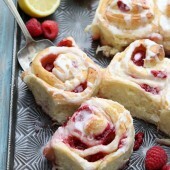 Hi Rachel, I just found this through pinterest and am so excited to make it! I have done a little bread making, but want to do more of it. I recently got married (end of August this year, so a brand new newlywed here!) and as one of my wedding presents I received a standing mixer. 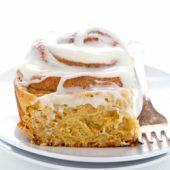 I would love to make this tonight, but do not have bread flour, is it okay to substitute with all purpose flour? Thanks for any help! Hi Rachel! I tried it tonight, and it turned out great! Though, I think my pan was a little small so it kinda baked in this snake loaf form because the stacks spread a little sideways, but otherwise turned out deliciously! I have to work on getting a little larger loaf pan next time or cutting the recipe down a bit. Overall it was delicious, and I am so with you on the whole warm bread thing. I ate almost half a loaf by myself tonight. It was so good! Thank you for the recipe! As far as the texture goes, it got a little crispy on the outside, but was soft and delicious on the inside, not too dense, but not too crumbly either. Really it was perfect! Keep sharing the good stuff! I did a test print fine on my end so I imagine it must be an error with your computer or printer. I haven’t personally ever used a bread machine so I can’t be entirely sure. But so long as you take it out before it starts cooking, I imagine it should be okay. Thanks, Rachel…using the dough cycle on my bread machine worked great! Lokks great. Can I freeze it once it is made? I haven’t personally frozen it. But, if you’re familiar with freezing bread and proper methods, I’d go ahead and give it a try! So this may be a stupid question with an obvious answer, but I’m a little confused by the cutting into 6 thin slices then cutting into 6 stacks. I understand the you cut it, but I got confused by the mix between 6 slices and how they became 6 stacks. Any detailed instructions on this would be wonderful! Cut into 6 equal strips, stack them and then cut into 6 equal stacks. Beautiful loaf of bread, Rachel! OH that looks incredible!!!! 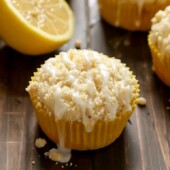 PINNING for my next game party :) LOVE your recipes always! How long is a normal first rise for this recipe? It can vary but on average most bread recipes will take at least 60 minutes, give or take. Are these dried herbs or fresh? Thanks! What a great idea!! 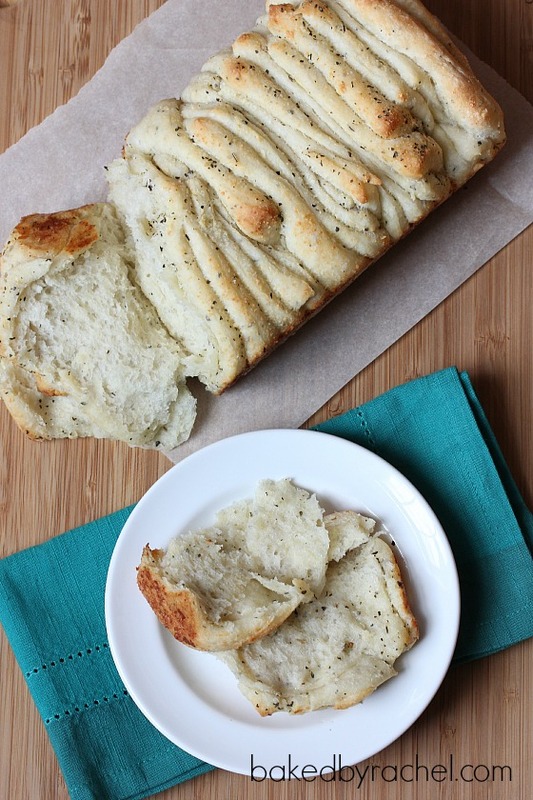 I often make garlic breads, but this version is a must try for my next time! Thanks! I made this bread tonight to serve w/lasagna rolls and it was delicious! I made the dough in the bread machine then followed your steps for rising etc. I did struggle w/cutting and stacking the dough (it was sticking and stretching) and it certainly isn’t as “pretty” as your picture, but boy did it taste good and that’s what matters. Thanks for sharing! I’m so glad you enjoyed it! I agree, the slicing and stacking can definitely be a bit tricky. Made this today to bring to a friend’s for dinner. Can’t wait to try it! 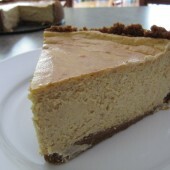 Rachel- it was definitely a hit at dinner last night and so easy to make! Thanks for sharing! So glad to hear it, Christie! This looks and sounds delicious. I don’t think I would be able to resist it either. Looking forward to making it soon! Love that it’s a pull apart bread. I just wanted to send a quick comment to let you know how amazing this bread is! I made it for an appetizer and served with marinara sauce. 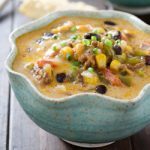 It was super quick and easy to throw together and was a huge hit with my family. I will make this again for sure, thank you for the great recipe. I am a bit new to using a stand mixer for breads. Paddle attachment or bread hook for this recipe? So glad you enjoyed it, Karina! I understand how to make the stacks, but I don’t understand which way to cut the strips. If the rectangle is 12″ x 20″, they could be cut lengthwise (so each strip is 20″ long, or the other way, so each strip is 12″ long. Are they 12″ long? Excited to make this tomorrow!!! I love your pictures!!!!! There should be six 12-inch long strips that you then stack and cut into equal stacks. I hope that helps. Enjoy! Dried herbs should be used. Enjoy! So glad to hear it, Ilona! Thanks so much for sharing and I hope you enjoy the apple bread as well! Hi! 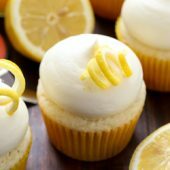 I want to bake this for my sister and bro-in-law who will be visiting soon. I was wondering if I could substitute all purpose flour. Would it matter tremendously? For best results I’d recommend sticking with bread flour. Typically you can substitute them for each other with slight changes, however the results will not be identical. Thanks Rachel. Finally made this yesterday for a high tea and it was gone in minutes. Just about saved some for breakfast today. Loved it myself. Just wondering what kind of Parmasen cheese. Shredded or grated? Finely grated would be best. I would like pictures on the stacking and slicing procedure. I’m a visual learner. You can refer to this post for a single stacking photo. I’m an avid bread machine user. 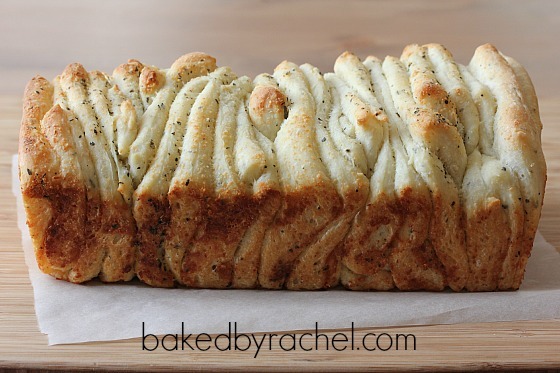 But this Thanksgiving I’m trying your garlic & herb pull apart bread. I searched thru several recipes & I feel your recipe will be the best. Thanks so much. Happy Thanksgiving 2016!!! ?I made the bread with the help of my daughter. It turned out WONDERFUL!!!! The aromas that filled our house were tantalizing!!!! Myself, my husband, son, daughter loved the bread. 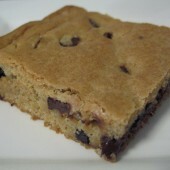 I am actually going to try one of your dessert breads this weekend. ? Do you use dried thyme or ground thyme? Dried thyme should be used. Enjoy! what changes are needed for high altitude..as in Denver, Co. There are some tips for you HERE. Good luck! Hello Rachel! I’m very excited to try my hand at making this bread. 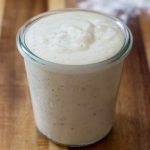 Is it possible to prepare the dough and refrigerate it after the first rise in order to bake it the next day? I see that you suggested that in your Apple Cinnamon Pull-Apart Bread and would like to know if it would work with this bread too. Thank you! This is exactly what our kids requestedfor Thanksgiving! Is there a printer icon hiding somewhere for a printable version?